Behind every angler’s great day floating the river is a fishing guide who worked his or her tail off to put those anglers on fish. At the start of 2018, I was between jobs, still in school (because any fly fisher must be a procrastinator, and fishing got in the way of education for more years than I’ll admit), and almost upside down on the loan for my truck. I was whining about my problems to a buddy while out fishing one evening, and he asked me why I didn’t just go be a fishing guide. Well, first off, there’s no such thing as just “going and being a fishing guide.” Sure, you can go row a boat down the South Fork of the Snake River all summer and if you don’t spend all your tip money on beer, you might come out ahead. But if you want to be a successful guide, you have to work at it harder than most people realize. I’m lucky enough to know a handful of guides quite well, and a few of them I can even call close friends. DelVecchio’s not exaggerating the self-restraint guides have to employ at times; I’ve seen it firsthand. Most anglers, I think, understand that guides work a lot harder than they appear to. But how many of us realize what that really means? I didn’t; not for a long time. Over the years, though, I’ve come to appreciate the good – and great – guides with whom I’ve fished. While their locations and tactics may change, a day in the life of a fishing guide doesn’t change much from Alaska to South America. In fact, it looks a little something like this. Familiarity with local waters is one of the biggest advantages of hiring a professional fishing guide. You’ll learn more in a few hours on the guide’s home water than you will in a month spent watching YouTube videos. The Night Before – 8:00 p.m. – 10:00 p.m. Text or call the clients to make sure everything is good to go for the next day’s trip and confirm the meeting place. If it’s a full-day trip with lunch included, make sure you either have enough bread and lunch meat for sandwiches, or the lodge has lunches ready for you to pick up the next morning. Double-check the cooler for adequate supplies of soda, water, and beer. Double-check the gas tank to make sure you don’t run out of fuel between the lodge and the boat ramp. Make sure you have your shuttle lined up so your truck and trailer are waiting at the takeout at the end of the float. Tie flies, because you can never have enough. Put the right rods in the boat, strung up, with new leaders and flies already tied, so you can hit the water ready to fish. The Day Of – 6:00 a.m. – 8:00 a.m.
Wake up, find a shirt that doesn’t smell too offensive, make sure your beard isn’t harboring any food from the night before, and grab a hat. Question why you do this for a living before the first cup of coffee gets in your veins. Double-check the fly rods are in the boat. Triple-check the drinks and food are in the boat. Clean the boat since you probably forgot to do that the night before. Get to the lodge/meeting place about 45 minutes early to make sure you have time for a second cup of coffee and breakfast that isn’t just a protein bar. Guides – the ones worth the money – are teachers. They’re educators, stewards of the rivers and the fish, enthusiastic no matter the weather or circumstances. The Day Of – 8:00 a.m. – 1:00 p.m.
Meet the clients, introduce yourself, and get them excited about the day’s fishing. Even if the river’s been tough as hell the past few days, and people aren’t catching much at all, you still have to do what you can to put your clients on fish. Answer questions about what flies you’re using, where you’re fishing, and what the clients can expect. You have to find a way to both temper expectations but not undersell the trip; striking a balance between optimism and realism is imperative. Sit in the usual 9 a.m. traffic jam at the boat ramp, waiting for your turn to launch. Launch the boat, park the truck where the shuttle guys can drive it down to the takeout, and then go over the rules of your boat with your clients. Spend most of the morning observing clients fish, correcting technique, teaching clients skills they’ll need to be successful that day, and not pointing out every fish they miss. Take at least a dozen pictures of the day’s first fish, because if you go fishing but don’t have pictures, did you even go fishing at all? Watch two anglers’ lines as they cast flies with sharp hooks over your head, ensuring they avoid tangles as much as possible. Watch both lines and match the drift of the boat with the drift of the flies or indicators, too. Find a non-crowded spot on the river to pull over for lunch. Make lunch, get clients their food, and stretch your back from a long morning of rowing and netting fish. The Day Of – 1:00 p.m – 5:00 p.m. Prepare yourself – and your clients – for the usual midafternoon lull in fishing. Fish the spots you know always produce fish when the afternoon gets really tough. Share interesting knowledge about the river, the area, the fish, or fishing in general, to help teach the clients something they didn’t know before. Keep the clients entertained even if the fishing is slower than you at the end of the season. Arrive at the takeout and navigate the 5 p.m. traffic jam of boats, trailers, and tired, grumpy guides. Drive the clients back to the lodge/hotel, drop them off, and hope for a good tip. 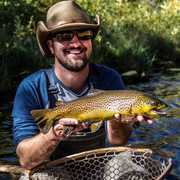 Professional guides are dedicated to putting their clients on fish. One way they do this is by teaching anglers crucial skills like reading water, properly handling fish, and understanding behavior. Tongue-in-cheek comments aside, this is a fairly comprehensive overview of what a guide does every day. There’s so much more to the job than rowing a boat, netting fish, and taking pictures. Guides – the ones worth the money – are teachers. They’re educators, stewards of the rivers and the fish, enthusiastic even when it’s snowing in July. They don’t make a big deal out of a client losing the fish of the season – “It wasn’t as big as it looked,” is a common refrain from guide to client after a trophy outwits the angler – and they’re genuinely stoked for each fish their client catches. Remember that old saying, “behind every man is a good woman?” Well, in fly fishing, it’s not a stretch to say that behind every angler’s great day of floating the Henry’s or the Madison or the Green is a guide who worked his or her tail off to put those anglers on fish. This is so true! There are many things that to happen before, during and after a trip that clients don't see. On the water guides are studying the wind and water, watching for cues to how things are happening or about to happen. Success favors the prepared. As a full-time fishing guide I do my best to be everything short of miracle worker! The best guides will put you on fish everyday,we can't make them bite,we can't make them be big and we can't put a hook in them for clients be we will do our best. I feel the sting of a hard day for my clients and I celebrate the successful trips. Definitely take the time and help kids get out there on the water. Get them hooked on fishing early!